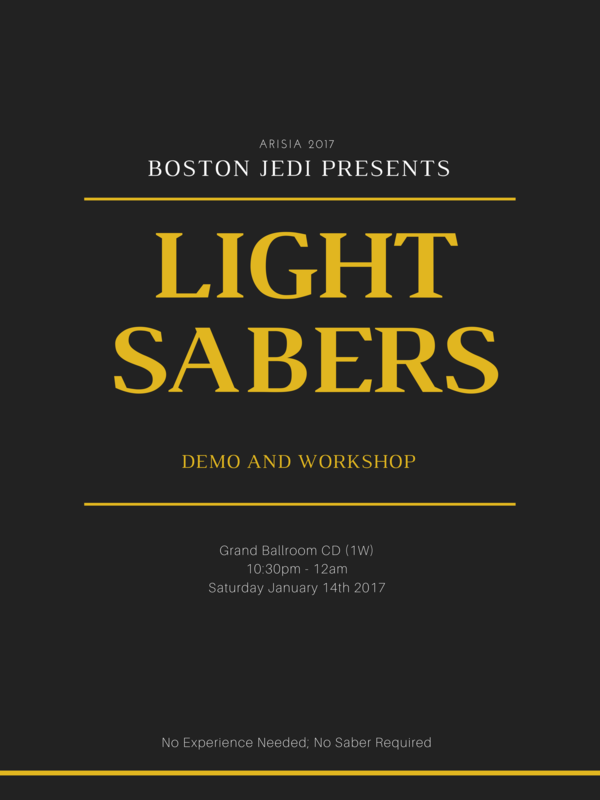 Boston Lightsaber Stage Combat Club is... wait for it... a Boston-based lightsaber stage combat club. 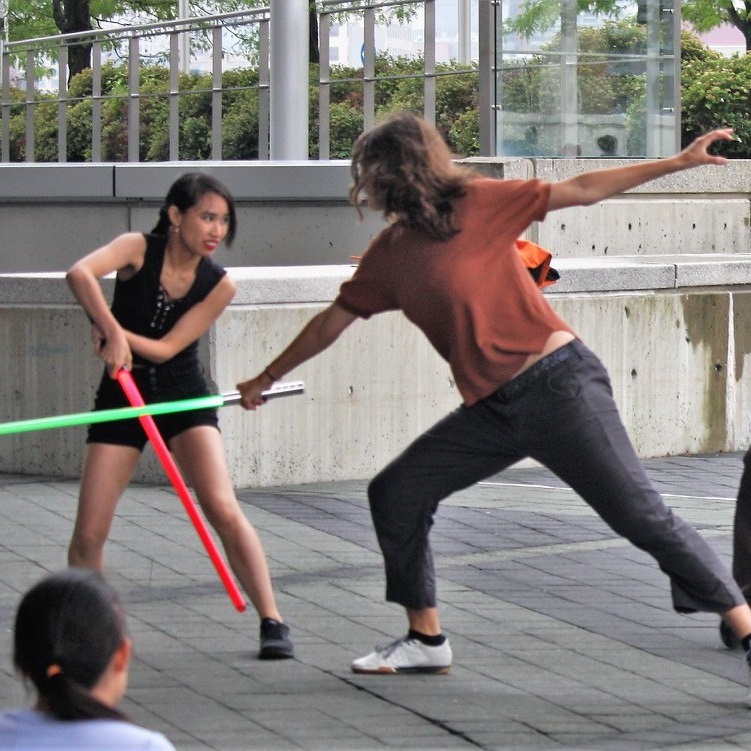 We are looking to get Star Wars fans together to create and practice with lightsaber props to create visually engaging stage combat for audiences, whether that's 3 people in a hallway, a stage in front of a room full of people, or an outing on Boston Common. We start with drills to practice fundamentals. Nothing like constant repetition to build a good foundation! From there, we split into small groups. In the early weeks of a rehearsal schedule, we're working on developing new choreography - either coming up with a brand new sequence, or extending an older sequence with more material. In the later weeks, we are focusing on mastery: not just merely memorizing the choreography, but learning it cold. Being able to move fluidly with your partner takes a lot of practice! This is where the earlier drills on fundamentals really pays off. The last 2-3 weeks are dedicated to show run-throughs. What about Cosplay or RP? We are not a cosplay group, although some of our members do SW cosplay. Likewise, we are not a roleplaying group, although some of our members do SW RP. We are not affiliated with Lucasfilm in any way, although we are encouraging our members to create a costume and apply for membership in one of the Lucasfilm-recognized groups: the 501st Legion (as a specific Sith Lord), the Rebel Legion (both specific and generic Jedi), or The Dark Empire (as a generic Sith). We have Beginners' Nights before we start a new rehearsal schedule. For details on when those will be scheduled, please follow our Facebook or join our Meetup group. These workshops are typically on a Thursday night in Cambridge, from 7:30-9:00pm, and are free. 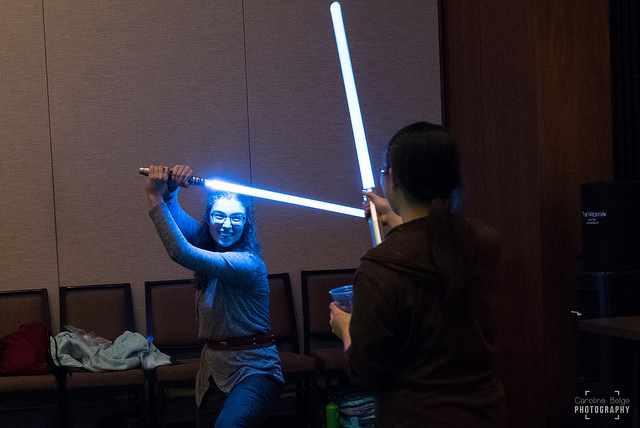 In addition, for the past few years, we've run a workshop at the Arisia Science Fiction & Fantasy Convention where we teach the basics of what we do, with an emphasis on going slowly and being safe. Safety is paramount at BLSCC. You are responsible for your own safety and your partner's safety at all times. BLSCC welcomes all fans. We will not tolerate any harrassment: reports of harrassment will be promptly investigated, and violators will be disinvited from returning. Our full anti-harassment policy is online as is our Charter. Come to learn, come to teach! Everyone has something to contribute. If you know experience with stage combat, dance (of any form), or any martial art, your knowledge is definitely applicable. Even if your only experience is "I've watched the Star Wars films", that's still valuable, and we'll want your opinion. 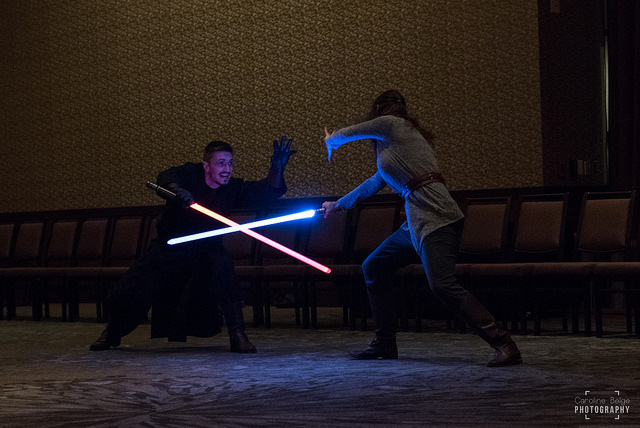 Likewise, no one here is the be-all and end-all master of lightsaber stage combat. Everyone needs to be open to learning from other people. Once again, we had a small show and then hosted a novice's primer for convention participants. Sith ghosts? In the Jedi temple? Zoinks! Intrepid Jedi adventurers explore an ancient abandoned temple, and it mostly goes okay. For our debut outing, we performed scenes in progress outside of Boston Comic Con / Boston Fan Expo. To accommodate different levels of how much time & energy people wanted to commit to each week, BLSCC split off from Boston Jedi. Dave and Meg started the club, practicing in Ten Hills Park in Somerville, MA. 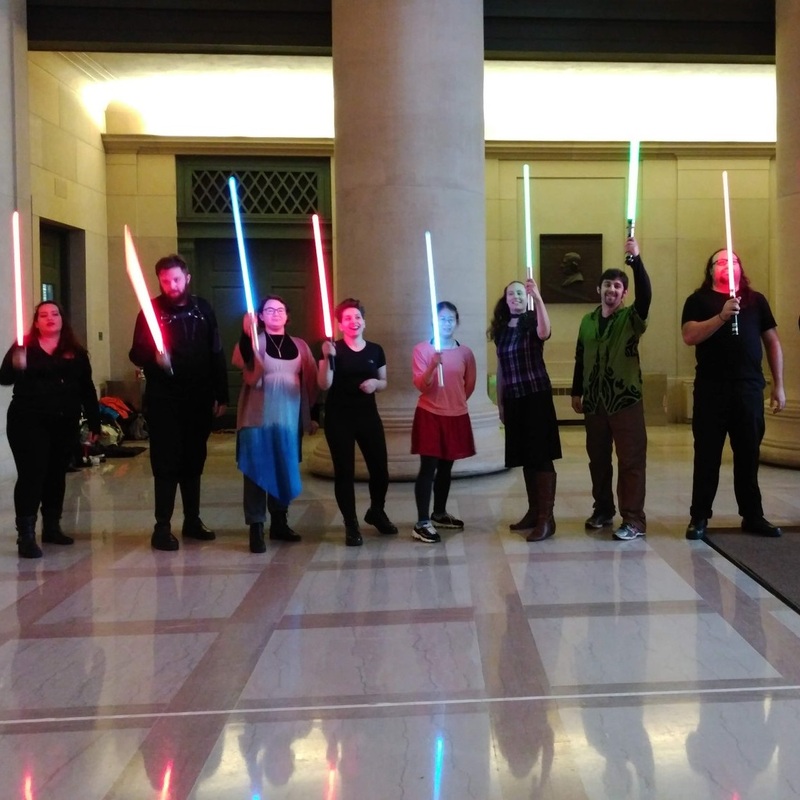 Later, Boston Jedi moved its practices to MIT in Cambridge. How do I Join BLSCC? Beginners' Nights are held the first 2 weeks of a rehearsal schedule. Check out our Facebook or Meetup for upcoming Beginners' Nights, which will always be on a Thursday night, from 7:30-9:00pm, at MIT. For a Beginners' Night, all you need to do is just show up! Dress comfortably; layers is recommended, as you may get warm as we move around. 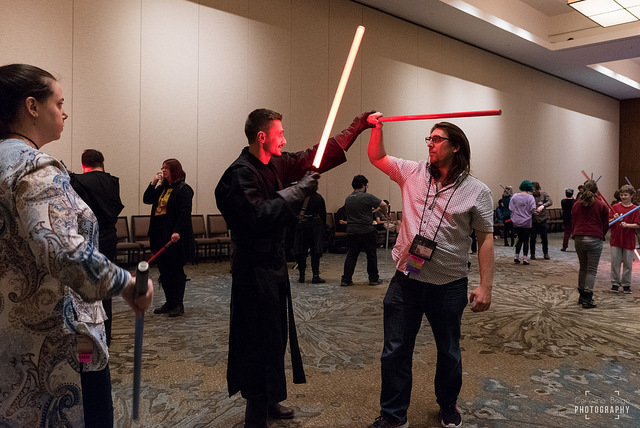 We will have loaner sabers, as we do not expect new members to have their own stunt saber. There is no committment in coming to a Beginners' Night. Hopefully you'll want to join us for a performance, though! We plan on accommodating all beginners for a performance: you'll be given a small role appropriate for a beginner. You will only need to come to Thursday practices to be ready for the performance. While we're here to have fun, BLSCC rehearsals are for serious practice. As some members have limited time, we must make the best use of the 90 minutes of rehearsal, which requires everyone to be both focusing and working hard during rehearsal. 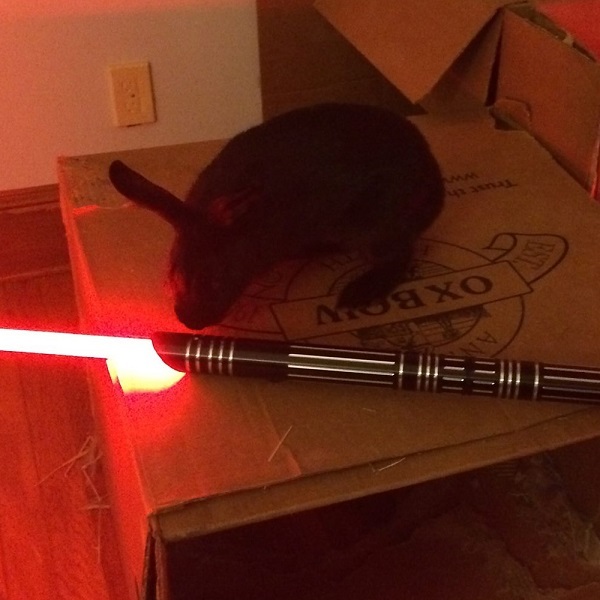 People interested in a more relaxed group should instead consider joining Boston Star Wars Fans on Facebook. 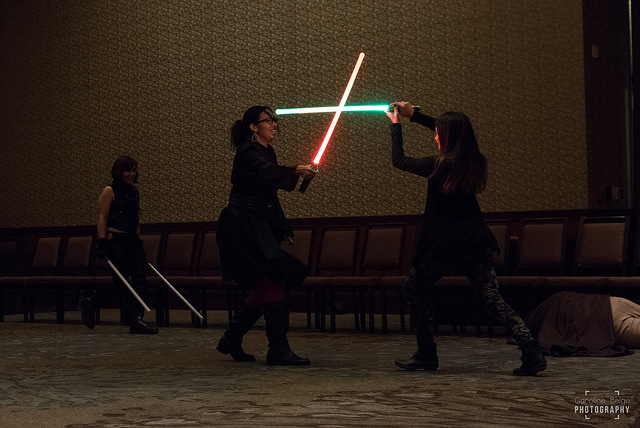 Boston Lightsaber Stage Combat Club is an 18+ group. How do I find out when Beginners' Nights are? You can get event reminders and last-minute updates by finding us on Facebook or Meetup. I have more questions; is there someone I can email? 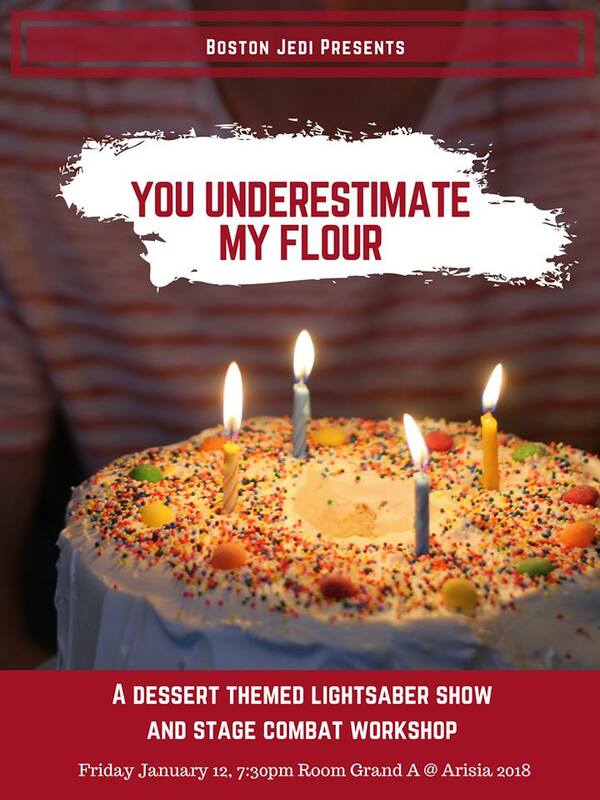 Yes, please contact us via bostonlightsaber@gmail.com. BLSCC choreography is licensed under a Creative Commons Attribution-NonCommercial-ShareAlike 4.0 International License. Many photos on our site by Caroline Belge Photography. 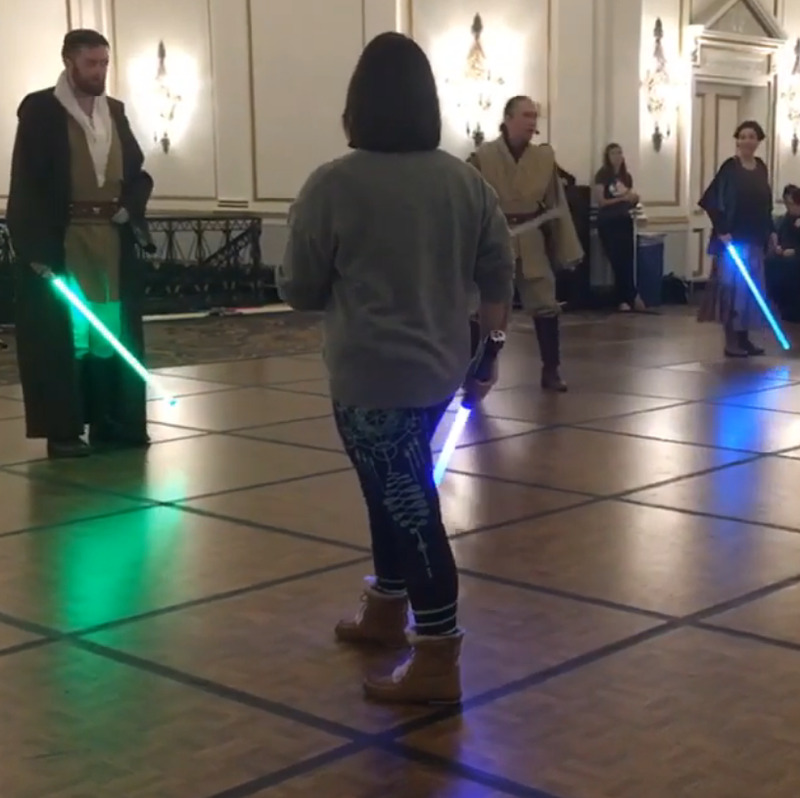 Copyright © Boston Lightsaber Stage Combat Club 2019. Not associated with LUCASFILM LTD.™ or any LFL Ltd.™ Film or Franchise. We will have a short show and then immediately launch into a stage combat workoshop as in past years. A free lightsaber show at dusk. Jedi Rodger and Dan think they are on their way to Space Waffle House, but what they uncover is far more spooky! We'll be performing on the grassy "Dot" in front of MIT's Green Building. Many of the lightsaber techniques we see in the Star Wars movies are based on Japanese and European sword traditions. 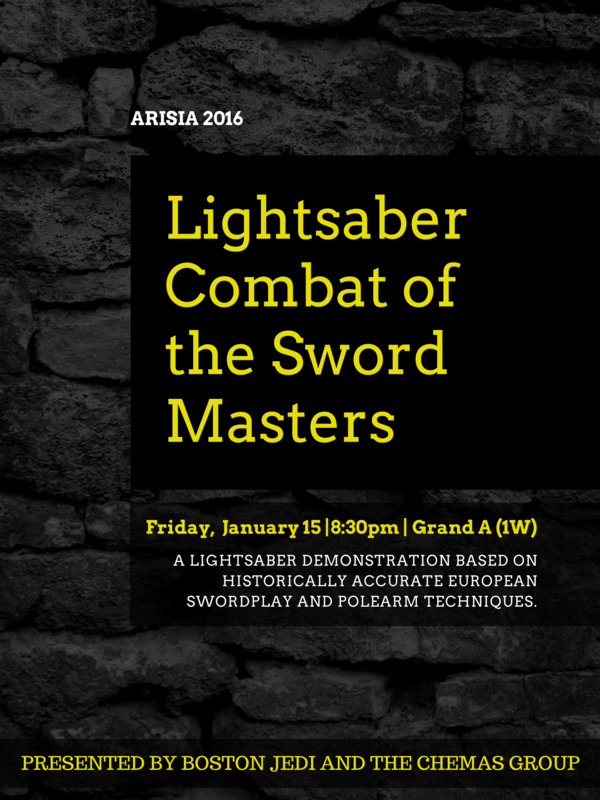 Watch as BLSCC presents a lightsaber demonstration based on historically accurate European swordplay and polearm techniques used in the Middle Ages and Renaissance. 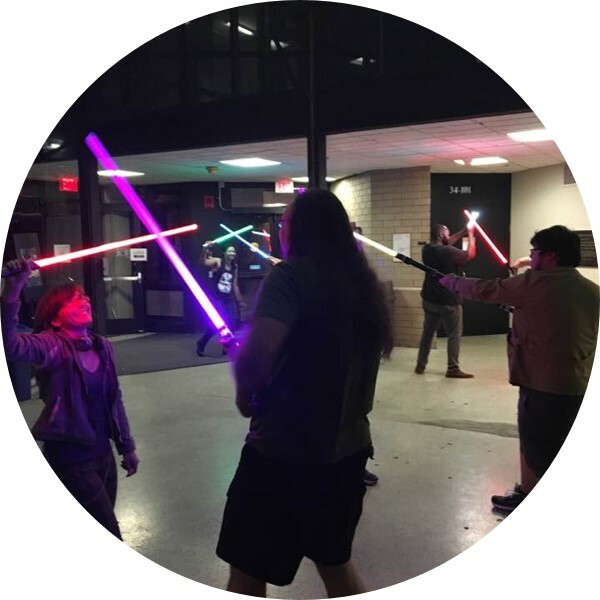 After the demonstration, we invite teens and adults to join us for a workshop in theatrical-style lightsaber-combat techniques; choose whether to be a Jedi or a Sith. May the Force be with you!